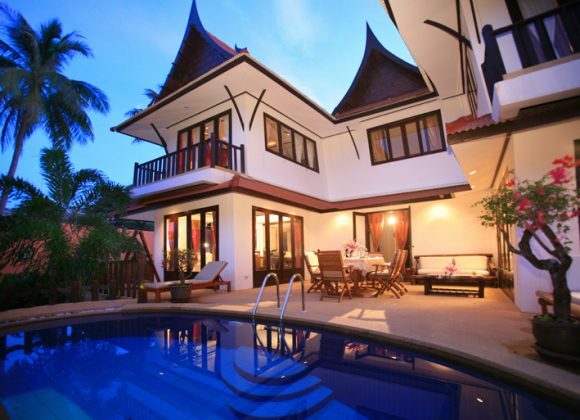 Luxury Holiday Villa Rentals in Koh Samui. Welcome to Paradise Island Estate Koh Samui, your authentic Asian experience where pure luxury and exceptional service, design and quality are guaranteed. Located in Koh Samui, arguably Thailand’s most sought after luxury island, Paradise Island Estate is the island’s premier address Choeng Mon Beach. Set in a true oasis among giant coconut palms within a fully walled private estate, in a gentle elevated position, Paradise Island Estate’s nine large and luxurious private villas are ideally situated for you to enjoy an unforgettable beach holiday in this tropical paradise setting. The prestigious Paradise Island Estate combines beautiful Thai design with the exceptional attention to detail our exclusive clients have grown to expect. We ensure that your extraordinary Koh Samui luxury villa rental includes every conceivable detail. Each unique luxury villa comes equipped with designer Bvlgari toiletries, and inspired à la carte breakfast menus, all come as standard. Choeng Mon Beach is an unspoilt crescent of fine pure white sand, with breath-taking views across the sparkling azure-blue waters of the bay and its amenities. Here guests will enjoy a vast choice of restaurants ranging from local to gourmet cuisine. The 9 luxury villas are extremely spacious internally, and have been built with beautiful distinctive traditional Thai roofs. Each has its own very special personality. The unique honeymoon cottage suite and Royal Pool Suite Cottages will cater for small families and couples. Our newest addition, Presidential Thai villa and Imperial Thai Majestic villas along with the exceptional and magnificent 4-5 bedroom Royal Thai Villa boasts Koh Samui’s biggest en-suite bedroom, with panoramic sea-views. The superb Royal Thai Villa enjoys an enchanting private infinity swimming pool with a separate children’s pool. The 3 bedroom villas have two very large, virtually identical en-suite master bedrooms upstairs (ideal for two couples) and a further good sized en-suite bedroom on the ground floor. All of the bedrooms are Air Conditioned. Each of Paradise Island Estate’s Koh Samui holiday villas has a large spacious lounge and an equally spacious dining room, along with a fully equipped gourmet kitchen that includes every amenity. Each luxury villa at the Paradise Island Estate Koh Samui has its own private beautifully sculptured infinity swimming pool and is surrounded by dense and luxuriant tropical landscaped gardens which allow guests absolute privacy. The gardens include Banana (pick your own), Coconut, Mango and Papaya trees, plus many other types of palms and tropical plants. 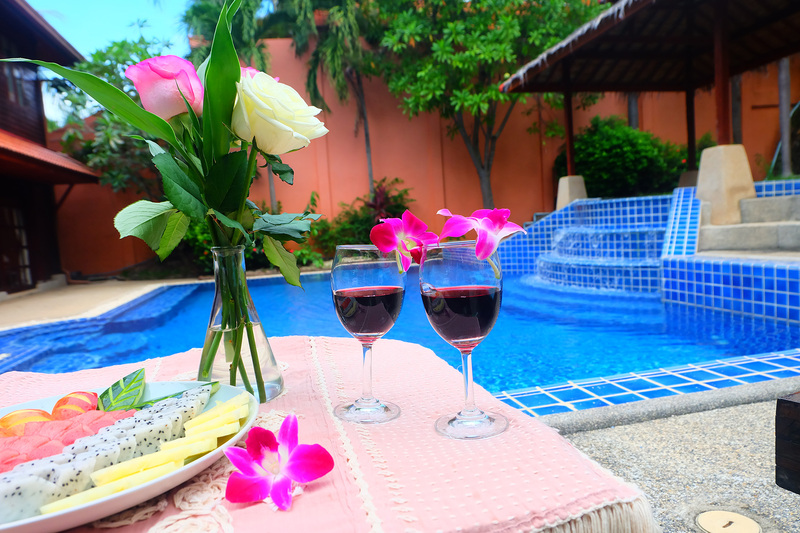 Each of our Koh Samui holiday villas has a large swimming pool patio area are equipped with comfortable sun loungers, sofa area, day beds or hammocks and tables, chairs and a barbecue for dining al fresco. Each of the nine Koh Samui luxury holiday villas can accommodate between 2 and 12, guests and private parties of up to 56 guests can be catered for, ideal for weddings, corporate events and family reunions. Our aim is to provide our guests with deluxe hotel services within the comfort, privacy and space of their own Koh Samui luxury villa in this tropical paradise. Our Paradise Island Estate team looks forward to welcome you home soon. perfectly located on Koh Samui Island, with the Choeng Mon Beach right on its doorstep. Cheong Mon Beach is a find. The beach is a very short walk (or the Paradise Island van can drive you!) from the villa. It has all the good stuff that Chaweng beach boasts, but is MUCH less congested. We felt like we stumbled on a secret! There are absolutely beautiful white sand, spectacular views, and a calm surf (good for those with young children because there is plenty of shallow water before a gradual dropoff). There are beach chairs/umbrellas set up to rent (low cost) and plenty of options for snacking, dining, and grabbing a drink. Step out to the street and you’ll find many family run restaurants with fresh fish, Thai favorites, and European food if you must. 4. Great Adventures. Whether you want to snorkel, hike/drive to stunning vistas, kayak, scuba, see amazing cultural sites, or simply shop, the staff at Paradise Island can help arrange your adventure. We did a Day 1 tour with the Paradise Island driver taking us around the island. We also did a third-party boat tour that encompassed several islands and included snorkeling, hiking, and kayaking (a good lunch was included) — this one was stellar. (cost is extra) And we did another snorkeling-focused tour that hit some of the more trafficked areas. However, the coral is still in good condition and the aquatic life was lovely. 3. Dining. You might not consider how breakfast shapes your trip necessarily, but we absolutely adored the breakfasts at Paradise Island. The woman who cooked and the food started each of our days out right. There is a wide choice of options, and we tried most of them. All breakfasts included a big plate of fresh fruit, too. They were super. (We were two couples, but there are plenty of options if you have kids, too. They’ll love it.) You can also enlist the services of a chef onsite for dinner. In terms of eating out, the Paradise Island staff recommended some options, and they helped arrange reservations where we needed them. One of our best meals was the driver’s recommendation for lunch during our island tour. The restaurant had yummy Thai dishes, a panoramic view, and lots of birds and butterflies lofting about. 2. Friendly Helpful Staff.Our Koh Samui experience was phenomenal because of the people who own and those who staff these villas. From our first emails to our final farewells, we could not have been more pleased with the people who operate this establishment. 1. AMAZING HOUSE! Our villa exceeded our expectations for size, comfort, cleanliness, and decor. While in close proximity to other houses and the commercial district, the villa felt very private. Inside the fenced property is an abundance of common space for getting together indoors and out. The villa is beautifully constructed of regional wood. The four bedrooms each had en suite baths, and there was an additional half bath in the common area adjacent to the pool. The house was immaculately clean, and staff tidied up each day. There were full appliances in the kitchen, good TVs, AC, tasteful decor and more. The beds were very comfortable. The pool was refreshing. There were both shade and sunny spots in the outdoor spaces. One could easily spend a whole vacation at the house if it weren’t there were such a wonderful land to explore beyond. I have just came back from my 2 weeks trips in Paradise Island in Samui. I have been there with my family. The villas are just… Wow. – The location (near the most quiet and peaceful beach of choeng mon). – The view (royal thai villa) from our 160m2 master bedroom ! – Private chef who came directly cook to the villa ! – The privacy (no one around and no noise). Perfect for my baby. – The Lovely staff. They are everywhere but invisible at the same time. Ong and the crew are so kind and we can ask them everything we need ! I would recomend Paradise Island ! Paradise Island Estate is pure luxury on ko Samui! We stayed here for 4 fantastic nights and Ong and her staff treat you like royalty! The villas are perfect whether you are a couple or a family (it was just the two of us in a gorgeous 3 bed villa) but will definitely return with the family! The villas were massive each with your very own pool. All secured by massive gates which they give you an electronic key to open – very fancy. I kept thinking this is how the other half live it’s like staying at a 5* hotel but the staff are there for only you and you have so much space to yourself! They offer baby sitting, private chef, you chose what time you would like breakfast and the staff let themselves in and have this ready for you! As well as providing you with a phone and loads of information on the island. The villas have stunning decor, very well maintained and clean couldn’t fault it at all It was just perfect. I couldn’t recommend staying here enough! Everything was made so easy from how attentive all the staff were arranging lifts etc. There are plenty restaurants close by, as well as a market which is on 1 night during the week, and football golf. A lovely quieter end of the island. The name gives it away - paradise!!! A beautiful stay in Paradise Island Estate. My entire family enjoyed a paradisiac holiday here. Service and our villa were superb. Ong and her team, our private Chef Koone were all very profesional and very pleasant, welcoming. We will recommend to all our family and friends. Fantastic !!! Amazing good, no need for restaurants. Great atmosphere and beautiful views and great privacy. The perfect place for large groups looking to spend some quality time together. Highly recommended! Excellent stay at this beautiful resort. We had the most memorable week of our lives. Service and accommodation are top notch. The tranquility and serene atmosphere are superb. Thank you for a special vacation to the entire team. The villa that we stayed at truly stands to its name. I was hoping for the Royal Thai Villa during booking because there are so many good reviews about it but we were given another 4-bedroom villa which is called the Presidential Villa and it was just as fabulous. The house is very spacious, the pool is massive and every corner of the house is spotlessly clean. Location is on a hill which is slightly outside main town hence it’ll be much more convenient if you rent a car when staying there. We booked 2 cars during our stay and the manager Ong had arranged for the cars to be delivered right to our villa. The cook who I believe her name is ‘Apple’ comes every morning to cook breakfast and clean the house daily. Overall we loved our stay, my children had so much fun swimming and playing in the pool and we would definitely recommend this place to our family and friends. We stayed 14 nights here in heavenly bliss, peaceful, restful. you could do anything or nothing. Ong is on call all of the time, always happy to help you in any way she is a wonderful lady. The rooms are spotlessly clean and the meals were excellent. We have spent 7 nights at this oasis after touring Thailand for 3 weeks. Our last stop to relax and chill out was Paradise Island Estate. What a great place !!!! Our villa manageress ONG and team could not do a better work and have made us fell home and comfortable at all times. Villa Baan Souha was more than we could have anticipated for. Immaculate and with all facilities we needed. Luxurious accommodation set in a true oasis. Service as breakfast and tours arranged were perfect. Surrounded by beautiful gardens to relax and enjoy full privacy. The beach is reached by golf cart and takes about 3 minutes . White sandy beach, shallow waters , true Paradise. Private pool is not large for swimming but perfect to cool off. Thank you for a first class week. The Villa was large, beautifully furnished and very well maintained – absolutely spotless. The grounds were really beautiful. It was a tropical paradise. We had been upgraded to a 4 bedroom villa and the pool was a good size. The Manager is called Francisco and I I never met him but he always answered emails very quickly. Upon arrival we were met by Miss Ong who gave us a phone and told us to ring any time we needed anything. There was also a number in the phone for a taxi driver who we used all the time – he was a bit cheaper than other local taxis. When we wanted to hire a car she had one delivered to the villa for us. The lovely Pon came and cooked our breakfast and cleaned every day for us. She was so nice and and sweet. It was a wonderful place and the staff really went the extra mile. Fantastic! Only one word can describe our stay: perfect. We have never before experienced this kind of service, where the staff did absolutely everything to make our stay magical. The honeymoonsuite was beautiful, with aquariepool and a jaquzzi. The breakfast was amazingly delicious, with our own private chef who made everything we wanted. If we could, we would stay here forever. We want to especially thank Ong and Francisco who made this stay so perfect for us! We recommend Paradise Island estate for everyone who visit Koh Samui, and especially couples because of the romantic setting the staff creates for you. Thank you again, we will never forget our stay. This was without a doubt our best stay on our three week long vacation in Thailand. Myself and my girlfriend where travelling around Thailand for a couple of weeks, I had booked this accommodation as a treat for us, having seen how amazing the properties had looked online and the great reviews. But it was above and beyond our wildest expectations, The transfer service provided was brilliant, even rescheduled for us been delayed without any problems. Ong welcomed us on arrival and upgraded us which was awesome we couldn’t believe how lucky we were. We stayed in the four bed villa, We have travelled the world but this villa was the best accommodation we have ever stayed in, it was spectacular !! A big thank you to Ong and her incredible staff they made our stay perfect. We are already planning our next visit to the Paradise Island Estate. Excellent family stay at this wonderful resort with beautiful and luxurious villas set in tropical gardens with private pools. Service is sublime and Ong was outstanding all the way, special thanks to our private housekeeper Mew for a marvellous experience and delicious breakfast. I highly recommend and we hope to visit soon. Spending my wedding anniversary with my family in such an amazing place with privacy was a good choice.. we took the largest villa there and it made us feel that we r relay spoiled ! It contains 4 large bed rooms with toilets ,some with a balcony facing the private swimming pool . The house keeper comes in the morning to prepare the breakfast just for you in the villa ! Weather was not too good but our hotel accommodation and Concierge Ong were outstandings. They made our family holiday the best we could have wish for. Villa was immaculate and staff could not do enough to please us. We will highly recommend and wish to return soon to a real home and see you all again. We spent 7 days at Paradise Island Estate in January 2015. We spent 6 nights here at honeymoon villa. It’s really beautiful, it has a private pool, a outdoor bath and a outdoor BBQ. The tropical garden really amazing. The manager, ong, is a great girl. She is welcoming and helpful. She helped a lot during our vacation. At the last 2 days, they said they would like to give us a better service, so we moved to “the park”, which under the same owner, but we didn’t like it. Maybe because of the manager? We’ll go to Samui again, and we definitely will stay in the same hotel. a tropical island in the Gulf of Thailand. The deluxe pool villa was perfect…well appointed and so comfortable. The grounds are a garden of Eden and Choeng Mon beach is breathtaking. The staff were so warm, welcoming and accommodating….great job by all. We have enjoyed our stay at Paradise Island Estate. With excellent service from the team, clean and tidy place, breakfast served at time required. We just felt like we were at home. I would definitely recommend it to my friends! All villas at this resort is worthwhile!!! Was here for 4D3N . Caring hotel staff and helpful. Nice views for breakfast , owe private pool in our villa. Value for money ! Close to Chaweng but far from noise. Is a great location for those who love calm, relax and peace. It a very good place for relaxing with the hotel facilities and those lovely hotel staff. I will definitely be back to this hotel for my next visit. Thank you for your great help and feeling warm by prepared us breakfast box catch up the early flight. What a wonderful New Year family holiday at this beautiful private pool villas. Weather was not too good but our hotel accommodation and Concierge Ong were outstandings. They made our family holiday the best we could have wish for. Villa was immaculate and staff could not do enough to please us. We will highly recommend and wish to return soon to a real home and see you all again. We spent 7 days at Paradise Island Estate in January 2015. The resort is amazing, beautifully-designed, peaceful but very close to all main attractions and Choeng Mon Beach. Was upgraded to 3 bedroom villa, and that was nice experience despite somewhat mixed feeling about decor (Egyptian style closets). I believe it was the oldest of all buildings at the Estate, but very well maintained and contained all what is needed. I loved the speed of response to any of my emails starting from the booking arrangements itself. The staff was always there, friendly and nice. Special request for Thai breakfast was considered, and will be introduced as one of the standard options as per my recommendation: as response to my feedback form, on what (again) the response was almost immediate! Great wifi. Beach not really next door, but buggy is there, and if using motorbike, would be not more than 5-7 minutes drive. However worth to visit. Much much nicer then Lamai beach! Highly satisfied and would not hesitate to return!!! Thank you. Excellent stay at this private deluxe villas where my family had a very memorable and enjoyable vacation. Service was superb and villa staff not intrusive but kept the property perfect at all times. Royal Thai is sublime and quality of decor and design are outstanding. Villa concierge was very attentive and cater for our every needs with style. Choengmon is a very pleasant beach with all needed facilities. A 1st class vacation where we will surely return and highly recommend. I’ve been to many hotels in my life and this one is in the top 5. The place is beautiful, clean and extremely pleasant – Yet, that can be said of many hotels in Thailand. What made me write a review is the amazing treatment the owner and the staff gave us. I have never felt so taken care of in my entire travels. Unlike other Thai’s service, the staff was very nice and did everything they could that we would understand each other: making us amazing (!!!) breakfast and making sure we would feel like home. I constantly had to leave tips, being overwhelmly surprised by the service I got at this hotel. Something needs to be said about the location. This is not a “prime” location. We rented bikes (at very low rates) and were riding them whenever we went to the beach (10 min ride) or the center of the island (7-12 min ride). This in particular, was one of the things that made this trip amazing. I got to see every corner of the island with the bike, enjoying Thailand almost as a local. Also, the owner offered to drive us around between 9 to 5, if we were too afraid to use the bikes. As I already mentioned – amazing. Don’t skip this place. I went on a trip to Thailand with my family (2 adults and 5 children), but just after arrival in Bangkok I found that I had lost my credit card. The vacation was now in jeopardy, as my vacation was ordered via booking.com and therefore needed a credit card on check in. But as I had received an email from the resort CEO prior to our arrival, I immediately called him to check what we could do about this situation. The CEO stated that I should not worry and he and his staff would make sure that my family and me would still be able to enjoy a FANTASTIC vacation – no worries he said! Within 10 minutes he send me an email with a clear game-plan that would make our stay possible, including a free airport pick-up, and the promise to provide my family with cash if needed. Also the staff arranged for a rental car, without any requirement of credit card… I have to say – what started as a very stressful situation was quickly cleared and we could continue to enjoy our holiday. Sometimes when you book via booking.com / hotels.com etc. you have the feeling that you are not “as important”, but in this case it was totally different. The stay at the resort was in a fantastic villa and with a fantastic resort staff. Every morning they prepared breakfast according to our wishes (please see my pictures), they arranged trips and always had extra time for our kids. The villa is situated 10 mins drive from Chaweng, the place to be in Samui, which is an optimal distance for a family vacation. During my stay I received several emails from the CEO, continuously offering his support to any challenge we could have as a family – without a credit card. Overall a fantastic stay, in a fantastic environment and served by a fantastic staff – WE ARE CERTAINLY COMING BACK – THANKS from all of us for your AMAZING support! We were upgraded from 2 bedroom villa to 3 bedroom. As soon as i entered to door – WOW!! This place is amazing, wonderful greeting, tour of accommodation, beautifully decorated. Staff were friendly and cooked breakfast was wonderful. More affordable than expensive 5 start hotels and far better service. Golf buggy transfers to local beach were always available. Villa mobile phone – what a great idea. Easy to contact our Villa Manager Ong who was more the accommodating. This resort on it’s own is amazing, but when combined with the assistance from Ong, it couldn’t be more perfect.She is a wealth of knowledge, friendly and good humor. Assisted us with car bookings from hotel and directions to various places. Highly recommended, and I hope to return one day. Thanks the CEO and manageress for their arrangement before and during my family’s stay in the villa. The arrangements for airport pickup and discussion on routes for private driver service via emails before the trips, friendly and helpful attitude of all the staff, private and serene environment, quality service… All these gave my family a memorable stay in samui. The geographical location is excellent as well that it only takes 10 mins to the airport and chaweng, and only 5 min to the cheong mon beach. Both the soft- and hard-ware of the villa are just irresistible. Will definitely come again in the future! My family and I stayed at Royal Villa and had the finest experience we could have wished for. Villa is beautiful and decor is elegant best facilities available. Our private housekeepers were fantastic and our Villa Manageress was outstanding ans cater for our every needs, private chef and tours. Service is of 1st class. Beach was a delight for the entire family and services and amenities just perfect. All in all, thanking the entire team for such a remarkable stay on Paradise. We arrived quite late on a Saturday and the manager, Ong, was waiting for us at our villa. She had upgraded us to a three bedroom which was enormous and luxurious. We couldn’t believe our eyes. The private pool was beautiful and clean. We had a private chef who cooked us breakfast every morning, which was five star quality. We could have pretty much what ever we felt like. Ong gave us a mobile phone we could contact her on anytime and if we wanted a ride anywhere in the area we could get a lift on their golf cart. The location is in a more family part of the island away from the busy touristy spots, but easy to get any where we wanted. The beach is close, but the villas are up on a little hill away from the main road. It is very private with a big security gate. We went to the full moon party and Ong organised everything for us – transport from door to the full moon party and back. I travel a lot and haven’t seen this kind of hospitality anywhere else before. A must stay for big groups, couples and family. Oh well. how to start, we do not really write reviews but Paradise Island Estate exceeded all our expectations in all aspects. to make it short, Villa Baan Chang was 1st class accommodation with all we.had wished for in this paradisiac setting and island. Estate director could not have been more pleasant and pro.,our private housekeeper Mew cooked us sumptuous breakfast and the villa was kept imaculate at all times. choeng Mon Beach is beautiful and we would love to return soon again. The best place I’ve stayed at while in Koh Samui. My friends and I stayed in a 4 bedroom villa with a private pool and spa. It was amazing. The villa was 3 storeys high with great views and balconies from all bedrooms. Beds and living areas were great and super comfy. The managers name is Ong. She was fantastic and made sure our experience was nothing but perfect. Her staff were just as good. They prepared our breakfast for us daily. When I say they prepared our breakfast I mean 5 woman came into our villa and cooked us what ever we requested. It was great. I would highly recommend staying here. I know that ill be back again. We had a fabulous time in this spacious beautiful villa. We were upgraded from a 2 bedroom to a 3 bedroom which was quite a treat for our kids to have separate bedrooms. Everything was great from the service and care of Ong, the manager, and Noi, the housekeeper, who made our delicious breakfast each day and kept the place spotless. The location is also good as it’s a quick drive to the beach and also easy to get to Chaweng and Bo Phut. We will be back some day! Paradise island exceeded all our expectations. We had a fantastic stay. Staff, villa decor and location are first class. We hope to return and visit this paradise again. We thank you for a dream holiday and your very warm welcome. We dont usually write reviews but feel we must do for Paradise Island Estate as our stay exceeded our family expectations. Few words to describe our experience at Royal Thai Villa. Beautiful Villa with elegant decor and superb architecture and elegance. A true gem in this oasis with 1st class services and amenities. A special thanks to Ong and Francisco who go out of their ways to ensure your stay is 6 stars. Our two families (4 adults, 2 teens, 3 children) spent 4 nights in the 4-room villa and were most appreciative of the very gracious manager, Ong, and her friendly team. They responded to all our requests such as extra towels and morning juices. The property is up a hill and one of our group had a leg injury so the staff’s availability to shuttle our group to the nearby beach at Chong Mon or to arrange taxis to Chaweng were especially important. The house is beautifully furnished and maintained, although we all made an effort to walk carefully so as not to slip on the highly polished floors. Everyone enjoyed the daily breakfast, especially the assortment of tropical fruits not usually available to the North Americans in our group. While we had children in our group, the house is particularly well-suited for a group of 3-4 couples. If you are looking for comfort and elegance, this hotel will be your home away from home. Royal Thai Villa is located close to Choengmon Beach and a shuttle service is provided from your Villa door step at times needed. Restaurants are available as well as nautic sports, nice strech of white sand with warm waters, pure paradise. hotel staff and reservarion were very efficient. Ong did a remarkable work and we are very grateful for this warm welcome. Villa is just amazing and will accommodate large families. Decor is sublime and all available facilities are well though. Welcome flowers and all other gestures were greatly appreciated, All in all a magnificient stay in Paradise. The hotel is just sublime. Super beach, very good private housekeeper, excellent Villa Manager, excellent service, fantastic breakfast, felt spoilt at all times. Just returned from a 3 nights stay with fantastic memories. Francisco and his staff were remarkable and we had a superb time with our group of friends at Paradise Island Estate. Villa decor and standings have a true Wow factor and service was excellent and exceeded expectations. The beach transfer was arranged at our requested times and facilities at Choengmon are superb. Location and villa privacy is very good and staff are not intrusive but always present. Resort is managed very well and we were all impressed by Paradise Island Estate where we hope to return in the near future. Samui is beautiful and we all had a very pleasant time and return home with many happy and memorable time. Thank you to make it all possible. Our family stayed at this hotel for 1 week and expectations were very high. We had the most sublime stay we could have wished for. Francisco was a great host and made all our demands possible as organizing tours and private chef in villa dinner. Thank you very much for a very nice stay at your beautiful villa resort. Our family enjoyed every moment of it and were blessed to have chosen this hotel for our stay as it could have not been better. From service to decor and beach, all ticked the right boxes. Very pleasant stay as a family, from the time we were met and greeted by Ong we felt very welcomed and relaxed to enjoy a very nice family holiday. We stayed in a 3 Bedroom Villa with Private pool and it was just perfect. Service, Decor, amenities were all 1st class. We will highly recommend you to family and friends and hope to be your Guests soon again. Our group of Friends spent 3 nights at this boutique Villa Resort . Experience was sublime for all of us, villa was very nicely furnished, decor is superb and service was outstanding. A special thanks to Ong and her team. See you again…..
We arrived from Sydney on our way home to Manchester after 3 weeks of travelling. We were looking for total relaxation and that is what we git and much more. from the moment we checked in, we felt very welcome, our villa manageress Ong was a great host and the entire team looked so well after us. Quality of service and villa decor are sublime. The rooms are clean and full of orchids and other details which marked the difference. Breakfast served by our Chef was of a large variety and quality. Choengmon beach is around the corner and beautiful, they drove us to the beach and back at our requested times in a Golf cart, very nice. We highly recommend Paradise Island Estate and will surely visit again. Thank you for a very nice stay. Paradise Team made our family stay a memorable one where we are looking very much forward to return. breakfast made for u, at own private outdoor kitchen.. Now the staff, they are beautiful, so kind, welcoming and help you out with tours, taxi, what ever you need. Warm hospitality with big smile. Staffs are quiet helpful, they are just like your personal assistant with caring and responsibility. The breakfasts were amazing by personal cook in our own kitchen. and complementary pick-up and drop off to airport was unexpected good service. We stayed for 4 nights and will be staying again next year. I just want to praise the reservation staff and entire team. They are absolutely amazing and assisted our family with all our requests. Our villa was beautiful and elegantly decorated. The gardens and the private pool are a true oasis. Breakfast served by our private house keeper was delicious. The hotel is three minutes from the beautiful white sand beach with all facilities. Thank you for a wonderful vacation. See you next year. Just came back after spending 1 week at this amazing place with a very professional concept. Lush tropical gardens full of fruits and coconuts surrounding this resort which consists of 5 private villas. The villa design and decor was very tastefully done and we really felt home from the time we arrived at the resort and were met by our concierge Ong. For breakfast great variety of food, you could choose from traditional eggs with bacon to waffles, pancakes, breads with cheese etc etc to sushi and noodle dishes. We were amazed by the genuine friendliness of the staff at all time, they really seemed happy to work there and the girls helping out with planning our day trips where very knowledgeable and organised. A very memorable stay in a paradisiac setting with remarkable staff and superb accommodation. We shall return soon. amazing accommodation, superb services and fantastic beach with many restaurants to choose from. Villa facilities are superb and we got our breakfast served each morning by our private pool patio, a dream come true. My wife and I spent 6 nights at Paradise Island Estate in their deluxe Villa Baan Chang. This is a very exclusive boutique retreat that can accommodate from suites right through to 4 bedroom luxury villas.The staff headed up by Ong are fantastic and cant do enough for you. The breakfast is cooked by your prívate housekeeper at your requested time every morning.We hope to return to this oasis and thanks all the staff for a very nice experience and welcoming. Excellent …The staff are very welcoming and friendly. The Villa was outstanding and set in beautiful lush tropical gardens. A beautiful location and Beach with all facilities. Highly recommended. all was at the highest standards and levels possible. Panoramic Sea views to die for, a true and very elegant Villa. We highly recommend Royal Thai Villa and Paradise Island Estate. We booked a 3 Bedroom Deluxe Villa for our stay at this beautiful resort. Villa is immaculate so is the service and sublime deco and quality of furnitures. We all had a fantastic stay and were delighted to have chosen this hotel. For our stay in Samui Island. Reservation was handled nicely by Francisco and all our needs catered by our Villa manageress. Thank you for making our stay a true success. We had a fabulous stay at this private boutique hotel. Choeng Mon Beach area is fantastic with its white sand beach and all needed facilities. Our Villa Manager was superb and made us feel very, very welcome. Property is immaculate and you get full privacy with hotel services, staff are not intrusive and breakfast cooked whenever you require it was a very nice touch, as well as welcome drinks, fruits, flowers in bed, patios. We would love to experience this paradise and services soon again. Thank you for a wonderful stay and very memorable experience. Excellent stay at Paradise Island Estate private Boutique Hotel. We were met and greet by a Private Driver at Samui Airport which the hotel sent complementary. After a smooth 15 minutes drive, we arrived at the hotel and were met by Ong and her team, very nice welcome touches in the property and private tour with a Golf Cart to show us around. Villa is beautiful and makes you feel home at first sight. Breakfast is served by your own private housekeeper and cooked at your needed times with a nice selection. We would like to thank the entire team for a remarkable work with 5* touches in all aspects. Keep your standards and beauty of this true oasis. See you soon. Large private Villa with all amenities and hotel services, a true heaven and paradise. Ong, the director is outstanding and has catered for our every needs and demands. True and beautiful Asian design Villas surrounded by tropical gardens. Location is fantastic and minutes walk from a beautiful white sand beach with all amenities.Just superb and hoping to returning in the very near future.Highly recommended. Thank you and see you soon. The villa was very nice, very clean. All the people and especially Ong were great, always available to be sure everything was ok. The garden was nice especially with a jacuzzi inside. great stay! My family and I stayed at Paradise Island Estate and were upgraded to their Royal Thai Villa. We are regulars to Thailand and we usually stay in Villas while touring the islands for a week each year. Our experience at Royal Thai Villa was just beautiful, this Villa is a property with fantastic deco and you can see that building this Villa was done with highest standards possible from the time you enter the magnificent lobby. Staff were fantastic and our entire experience from breakfast to Choeng Mon Beach is just very memorable experiences. We had a superb stay and wanted to say THANK YOU. Highly recommended. We visited Koh samui with my family and spend 12 nights at paradise island estate for our New Year vacation. After reading the great reviews we decided to reserve a 3 bedroom deluxe villa. We made the right choice as Villa is beautiful and come with 5 stars hotel services. Private housekeeper Mew was remarkable and villa manageress Ong was superb to assist with our every needs. Breakfast is served by the pool patio or dining room at your requested times and the choice caters for everyone paladar. Furnitures and deco is sublime and you feel in a true island spirit with magnificent tropical gardens and infinity pool, very private. Choeng Mon beach is great and our children enjoy every moment at this white sand paradise beach, restaurants and amenities are 1st class. Thank you to all Paradise Island team for a very special and memorable vacation in Paradise. We stayed at a 3 Bedroom Private Pool Villa and our party of 5 can only highly ranked this deluxe private hotel with a 5* mark. We had a sublime week, service to quality of decor and location.Villas are very private and spacious, architecture is Thai and decor is a mixture of Asia meeting Europe at its best. We felt home and very welcome soonest we were met at Samui airport, Ong our Villa manageress was a great host and always available to ensure our needs and demands were met. Choeng Mon Beach is a 7 minutes walk but Golf cart services provided at your Villa doorstep on call is a 2 minutes ride, the Beach is very nice and have plenty of restaurants as well as many water activities but is a much better and classier option than going to Chaweng Beach which is overcrowded. Services are 1st class and we cant wait to return at this beautiful oasis. A beautiful villa which is fitted to a good standard. Plenty of space (probably too much for the 2 of us) and would definitely suit a family or a group of friends who would utilize the communal space. Very friendly staff who seem to be very useful however we were fairly self sufficient and didn’t require much assistance. Breakfast was served every morning on the table at the time that you wanted it which was a nice touch. Overall, Highly recommended. The Manager, Service, Privacy, Villa Gardens, Location, Quality of Accommodation & Decor. they make your breakfast at the time that you need, and very very helpful and kind staff, it just the perfect place that you can have either with family or your friends. I highly recommend this place!! very very great staff, the CEO of this property was really helpful and whenever we have any concern he reply to us immediately. I will highly recommend this place to anyone want to visit Koh Samui island. We loved having a private garden villa on Samui for a few days. The staff was very helpful throughout our stay and we enjoyed the breakfasts cooked just for us on our villa’s porch. Cheong Mon beach is pretty and relaxing, and only a short walk from the hotel. If we didn’t want to walk, the manager was available to take us there on the golf cart. I […] didn’t realize it until we left, but I think the hotel provides a free airport shuttle so make sure you call the hotel before or upon arrival in Samui! We stayed here last week for 4 nights and I can only say that our heavenly Samui experience was enhanced by staying here. Everything from large rooms to bed, patio, garden, bathroom was super. Set in a quiet and peaceful location of choeng mon away from hustle and bustle of chewang and lamai. We have to add that excellent service n welcome was provided by our villa manager Ong and her team. Ong was very helpful, warm and efficient. She is really thoughtful n very helpful. Would love to come back. Nice garden and very private villa nice place with lovely staff. the honeymoon Suite is actually a private house with own garden. great privacy. We stayed for 3days and were given a honeymoon cottage. It’s like a small house in a small garden with a jacuzzi in it. They will cook and serve breakfast at our villa every morning. Choice of menu can be selected from the list given. Their staffs were attentive especially the manager, who was very kind and helpful. 2mins to the beach by golf cart but need to walk 400m to get to the main road for tuk-tuk. For muslim traveler: Breakfast dishes can be adjusted just like we want. They served halal juice and milk (we can see halal sign on it). Many halal restaurants around Samui but the nearest one is Akbar Indian that serve nice indian dishes with affordable price. Bring some stock of food since it wasn’t easy to get halal food/drinks from nearest Mart. Our first holiday away with a newborn, and a 3 & 4 year old! The villa was well kitted out, very quiet, yet five minutes from the beach, restaurants, etc. Ong was great, organising day trips and looking after us all! The pool and stairs were made ‘kiddy proof’ so no worries there. Would definitely return. We spent 10 wonderful days in the Villa Baan Cueymaille. The service was excellent. we looked forward every morning to the wonderful breakfast. The Villa Manager Ong has met us every wish. The beach is really close and accessible by golf cart in 3 minutes. The beach is very family and clean. We will definitely come back again!! Lovely villas with amenities and spacious too with a superb garden. Rooms’ decor is beautiful. Located in a quiet and tranquil area of Choeng Mon away from the hustle and bustle. Beach close to hotel is good. Chewang and especially Lamai are distant from this place. I must add that Ong the villa manager is extremely helpful, efficient and understanding.she met us when we arrived, gave us good advice when we needed and also drove us to the beach in her golf buggy. Thank u again Ong and Francesco for making our Samui Island experience lovely. Just a small suggestion – perhaps another resource or caretaker should be around at the villas later between 5pm & 10pm for any guest needs / emergencies. Restaurants on the beach and Orchid are good places to eat if staying at Choeng Mon. We have been vacationing for a week at Paradise Island Estate – Baan Chang Villa. Everything went as promised, starting with the airport pickup, daily breakfast, private chef BBQ/dinner, daily transportation back in forth to beach, etc. The Villa Manager Ong is doing a great job there and we want to thank her again for all the efforts. The location is not far from the beach, restaurants, and bars but far enough from hustle and bustle. Villa is very private with a great pool and garden. However, the villa is starting to show its age. The hardwood, stairs and door are loudly screeching at every movement. All TV’s are very old and the quality of picture is suffering. I hope the owner will put some effort to rectify these if he wants to keep the 5* rating. Also I suggest that in the breakfast list to add some veggie options. Overall, we got a nice vacation in a great place. The Manager,Service, Privacy, Villa Gardens,Location, Quality of Accommodation & Decor. We very much enjoy our stay, it was a fantastic experience. The villa services are just sublime, you get excellent services from the time you arrive at the airport. Airport transfer is complementary so make sure you give them your flight details. We would like to thanks all the team who did a remarkable work ans living in Bangkok we will return shortly as our stay is full of memorable times at your hotel. We had a sublime stay at Paradise Island Estate. Located at Samui best white sand beach, staff were remarkable and service is perfect. Large private tropical garden, Breakfast is cooked for you when you are ready, Electric Golf Cart at your doorstep for beach transfers and return, flowers in the room and many extra touches we experienced in our short stay.We will return and stay at this hotel for our entire vacation when we are next in Koh Samui. Thank you for such a delightful experience. We spent a fortnight in Villa Baan Souha , on our first visit to Thailand , and our choice was correct. From the moment we arrived at the villa to be met by Ong, it was a fantastic experience. The breakfast prepared in the villa is amazing from the sculptured fruit to the amount and choice . Ong and her team are amazing organising taxis , golf buggy service to the beach and collection, washing and ironing, advice on restaurants etc, together with the easy booking and advice from Francisco. The villa is spotless , and I have to say my standards are exceptionally high, but no problems at all. It is spacious , even though it was just for 2 of us , a family or 2 families would be comfortable as well. The area of Cheong Mon , was in our opinion correct too, we enjoyed the walking market at Bophut immensely and is a must if you are available on the Friday. Chaweng is different , very lively , my description is that it is trying to be like NYC, but not as glamorous or as large, still good to people watch though.think it would suit younger couples or stag and hen type more. We went to Tesco lotus , to get some groceries , but to be honest we ate out at lunch and dinner most days as the food was fantastic, from the beach cafe on Cheong Mon for lunch to Thai Orchid on the Main Street. The only minus is that we had a power cut one night for nearly 3 hours , it was really dark in the villa , my husband thought he had spotted some candles in the cupboard , on his way downstairs he fell, thankfully he was ok with only minor bruises and aches, it may be wise to provide some torches and or candles on both floors for safety reasons. We really enjoyed our relaxing holiday , and would definitely return to Thailand , and would also like to return to Paradise Island Estates. Very good experience. Staying in a villa but having hotel service. Villa was spacious and clean. Very nice breakfast prepared in your villa every morning. Possible to make your own personal wishes for breakfast. The manager was extremely helpful and had a mindset of that ” everything is possible”. Whatever request we had, our requests were handled extremely quick! I wish to go back soon again. Stayed here in early october for 2 nights to recover after the full moon party. We were in a group of 23-25 year olds the taxi man did find it hard to find though. The owner Hong couldn’t do enough to help us she gave us a lift to the beach in her golf buggy! we loved the villa so much that we didn’t even leave apart from to go have a meal out and to go the beach. Villa was spotless. The breakfast which was included was delicious. The fridge was stocked with soft drinks. Wireless was included and was very fast. Couldn’t recommend this place enough! Our large group hired all three villas at Paradise Island Estate. The villas were a perfect – We had couples, families & singles in our groups and this accommodation was ideal for everyone. We stayed in Villa Baan Chang. The bedrooms all had bathrooms and were very spacious. The bathrooms were large with baths & showers and double vanities. There was a walk-in robe with a make-up/dressing mirror & drawers. The bedrooms were large, very clean, comfortable & air-conditioned. They have balconies that look over the private pools and surrounding tropical well-kept gardens. You felt like you had your own privacy even if you are staying with a large group. The living areas are air-conditioned comfortable and relaxing. The outdoor areas are private with each villa having their own pool; perfect for sun-baking, relaxing and observing the wonderful features around the gardens. The kitchen is really well equipped and the breakfast made every morning by staff is wonderful & delicious. You can have your washing done for you which was great for a longer stay and it is all organised for you. Choeng Mon beach is really close and the food was excellent! We had a large dinner cooked for us by the staff and it was magic, sitting by the pool with a 5 course dinner was exceptional. The gardeners/grounds keepers, cleaning staff, cooking staff & baby sitters are all outstanding and are very friendly, but, also understand your privacy. We could not speak higher for the Paradise Island Estate manageress Ong. She helped us organise our day trips, tours and anything we needed help with. Nothing was ever too hard or a worry. She made us feel very welcome and special. I would recommend everyone to stay here. When we go back to Koh Samui we would not stay anywhere else. Our stay at Villa Baan Cueymaille was very relaxing. The bedrooms and bathrooms were spacious for eight people and the breakfast every morning was delicious. The villa manageress and her staff were very friendly.Choeng Mon beach was close and the Thai food was excellent. We thoroughly recommended anyone to stay there. We would definitely go back to Koh Samui again. Very enjoyable stay, everything on the high standards. Ong in particular makes a remarkable work with her team and was outstanding. Thank you and see you soon. Perfect Stay, thank you so much…………..
Everything was perfect, Ong is amazing. Thank you for making our stay so wonderful to all the team and Villa Baan Cueymaille Will recommend all our family and friends. We love the Room Size, Views, Thai architecture and services. This boutique hotel with private villas is a great stay in Koh Samui. I have never had better service with a hotel before staying here. The hotel workers were wonderful, courteous, prompt, and accommodating. They were especially great with my 15 month old daughter. Highly recommended. Location, staff, views, general ambience. By far the best place I’ll ever stay. Hillside location that overlooks the bay gives the villas a secluded and exclusive feel. The staff here are the most friendly and attentive yet least intrusive you’ll find anywhere in the world. It’s the little extras that make it special. The Infinity pool which overlooks the lush gardens and tall palms, the private Chef service and its food is excellent and great value. Great location away from it all yet at the same time near enough to the great beaches and restaurants. A special thanks to Ong and her team for this very special stay full of memories for the entire family. Amazing villas, Quiet and secluded – very tranquil. Good service and beautiful design. The hotel is located o a gentle hill overlooking Choeng Mon beach. Each villa is beautiful and we loved the Asian touches throughout. The staff is exceptionally friendly and accommodating. The hotel is small, so this is a good place for privacy and tranquility. The Hotel is about 5 minutes walk from one of Samui greatest beaches. All in all fantastic experience for our group of 21 with excellent facilities and services. Swimming pool & privacy with beautiful surroundings. The staff are wonderful, nothing is to much to trouble for them to make your stay an exceptional holiday. Villas and estate is beautiful and well located. The manager and staff members are all very friendly and helpful, the make a great job. We are grateful for their work to make our trip in Samui an unforgettable experience. Excellent service, Beautiful rooms, Stunning views,Delicious food cooked by your Private Chef.Resort was full but had the impression that we were the only ones there. Stayed at Villa Baan Chang for 3 days and the Orchid Villa for 4 days which has a beautiful garden. The staff did everything to make our stay enjoyable from arranging car rentals to excursions at no extra cost.I would definitely recommend this hotel to anyone who wants to be close to Chaweng but doesn’t want the noise and crowds that can be bothersome in the evening. Location, view, friendly staff, Value and all the extra touches to make you feel in Paradise. We started off our honeymoon in Koh Samui at Villa Baan Souha based off of the great reviews. It is a small resort (4 villas I think) but the benefit is the quality of service. The staff goes out of their way to help you in any way they can. 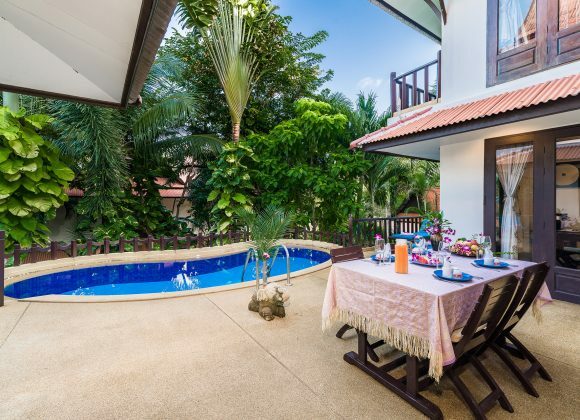 The location is great because you are away all the massive crowds at Chaweng Beach, yet you are just a short cab ride away or walking distance to all needed facilities in Choengmon. The pool is amazing, room service is sublime, and of course Ong who leads the team is sooooo nice. A special thanks to Francisco who dealt with our reservation and made us feel so much at ease, his knowledge of Samui Island helped us to tailor all our trips and must in Samui. Excellent staff care. The staff was good, it is more of a private hotel, since there is only four villas! Very relaxing and truly enjoyable. A superb experience where we are looking very much forward to return to. Relax and enjoy their fantastic services. This is a full Thai design hotel..you can find many Thai product in this hotel, it make you have a relaxing stay in this hotel..staff are very good,you have a private chef to cook for your breakfast..a very nice hotel for family..close to nice beach and all facilities, this was the best hotel we stayed at in Samui. Large comfortable villa with nice decor and private pool. We really enjoyed our stay at Paradise Island Estate. The kids loved it. This place is really an estate of villas and not a hotel as such. The villas are private and if you want a quiet place this is ideal. As the villas are built on a hill side you get excellent views of the bay and sea for miles. The private pool provided endless fun for the kids and the entire family. In the morning you get your own breakfast cooked for you by the private housekeeper. The breakfast is large and sumptuous. This was a nice touch. Also the staff are very friendly and attended to all our needs. Of particular note is the manageress Ong who goes out of her way to see that everything is ok. The villas are about 5mins from the beach. I would recommend to rent a car for your stay as Samui is a large island. Shops restaurants etc are also on the way to the beach. I would really recommend this place if you are looking for a quiet relaxing holiday away from the hustle and bustle. Calm absolute, serenity, let you rock by the reception, the kindness and competences of the staff, always with your listening and available permanently…..Big kisses to Ong and her team. You do not occupy of nothing, Ong is there to organize it all… the rooms are exceptional, the beds very softs and immense, the splendid bathrooms!! in a word, this is our most beautiful holidays that we have had, thank you Francisco for all that. Concerning the meals with the villa, try the Private Chef. We had a fantastic time in Villa Baan Chang and in Thailand! We really appreciate everyones help to make it so enjoyable and relaxing for us. We hope to visit again in a few years if not before. Best regards. This is a top class villa with all the facilities that our family needed. Our two girls loved the infinity pool! It is in a good location not far from some lovely beaches. The staff were fantastic and cooked a delicious meal for us one night. The villa was always kept clean and tidy. I am already recommending it to my friends. Thanks to Francisco for giving us a great place to have a wonderful family holiday. Our stay @ Villa Baan Chang was very good, it is located in a private estate and minutes away from Choeng Mon beach which is superb for the entire family with all facilities available. The villa and staff make a remarkable work and it is really as staying in a hotel but with the big bonuses of your own private pool and space. Ong who is the villa manageress makes you feel home and is a great host who had catered for our every need as Private Chef in-villa service, tours and all our demands were met and organized to perfection. Thank you to all of you who made my family stay an unforgettable holiday. Great group holiday accommodation. We rented the whole villa complex for our wedding guests, and could not have been happier with the service we received. Our key point of contact, Francisco, not only made the reservation process completely painless, he was a great source of information – always ready to help with any inquiry or problem we might have, he really helped to put us at ease. On arrival, the villa manageress, Ong, was a lovely host. Always smiling and ever helpful, even having unexpected guests show up awkwardly long after she had retired for the evening did not worry her. The rooms were well appointed, with great bathroom facilities. Our guests were very impressed and happy with the level of accommodation. We also arranged a dinner for 32 adults in the villas, which was catered for and organised by the team seamlessly. Food was lovely, and plentiful. The only comments we had from our guests was that the size of the pools were not as big as expected – however, this was not a problem for them. Additionally, some of the staff had little understanding of English, so although were extremely helpful and polite, there were some difficulties with communication at times. These were always easily resolved with Ong’s assistance however. A great choice for large groups wanting to stay in private villas, and easily accessible beaches. Dear Francisco, I would also like to thank you that you gave us the opportunity to stay in Villa Baan Chang. We very much enjoyed it and we also would like to thank Ong and her team again that she made our stay a perfect experience. I also would like to thank you that you are so kind to offer us any support of needed during our further stay here in Thailand. With best greetings. Lovely.We had a wonderful stay here in July of 2012. Booking with Francisco with a breeze – he was extremely helpful – both before and during our stay. The house is lovely – Ong and her staff are very professional. It is fantastic to have a manager on the premises – and the shuttle service to the beach is awesome! I would recommend this house to anyone looking for a fantastic stay in Choeng Mon. Dear Francisco, Your hotel is amazing, and our stay at your villa turned out to be excellent. We are extremely happy. If you find yourself ever going to Ecuador, please let me know, and I will be sure to set you up in our Hotel. Thank you again, and please thank Ong for her kind and superb attendance. Grateful to you. Three generations of our family stayed together in total comfort. We enjoyed the beautiful setting, pool, convenient location and excellent service and food. We all had a great stay and would recommend the Villa and plan to return ourselves. Koh Samui is a special place and is now one of our family favorites. Dear Francisco, We had a wonderful stay. Thank you so much. Ong and her team were great! Now we are back to getting unpacked and the kids ready for school. Have a wonderful weekend. Thanks again! and with the communication prior to our arrival. Upon arrival we were met in the evening by the villa manageress who was very helpful, friendly and professional, and we remained very impressed during our week-long stay. We look forward to spending another holiday there in future! This is the first time that we have reviewed any holiday property,but just had to take the opportunity of letting others know what a wonderful home and location we stayed in. The booking of the villa was really made easy by the prompt and efficient service provided by both Francisco and Chris,who went out of there way to meet our requirements and make life easy. Michelle was waiting for us when we came through the Customs at Koh Samui airport after a long and tiring flight and then she whisked us away within minutes, to what became our paradise for the next 7 days. The next thing we knew,we were sitting around our own infinity pool with a COLD welcoming drink in our hands,listening too..well nothing really, as it was sooo.. quite and peaceful. The villa was an absolute delight with it’s typical Thai roofed design and it’s beautiful and very special Thai furnishings. The villa is surrounded by lush tropical vegetation and it was absolutely amazing to see the Coconuts and Banana’s just hanging there in the trees! With the villas close proximity to the beach,restaurants and by local taxi when ever required to Chawang,we did not feel the need to hire a car,as it was all there! For the next 7 days we completely chilled out in this beautiful unspoilt location. On one of the days Michelle organised an ‘in house’ massage for us around the pool and on our last evening she organised a Thai chef to come in a cook us a very special last evening supper. She was absolutely wonderful and could not do enough for us. Amazing value for our money! To say we were sorry to leave when the time can is an understatement,but once again, Michelle in her usual efficient Swiss way, whisked us back to the airport and after much kissing and cuddling,not to mention a few tears,we departed this beautiful place. They say never go back, but we will!!! Dear Francisco, Hope you are well and not working too hard in Spain. Just wanted to say thankyou to you and your team for a wonderful holiday, the girls were fantastic and made our stay at both villas very special. Ong was especially wonderful, and nothing was too much trouble at all. Thank you for all your help and kindness over the past few months and we will be in touch again – when we are visiting Koh Samui. Please let us know how young Pop gets on in october when she has her baby! Once again thank you all so very much, we will also write on the website testimonial page. My wife and I have just returned from Villa Baan Souha where we have spent a week and very nice vacation. Reservation process with Francisco and organizing our arrival was very efficient. We were in Koh Samui for a second honeymoon and were delighted to have stayed @ Villa Baan Souha. The villa is very private and very nicely furnished, Thai style furnitures with Italian marbles and beautiful teka wood makes Villa Baan Souha a true and beautiful property for the most discerned traveler. Ong and her team were very attentive and discreet and catered for our every need. The villa gardens and its location are superb and we have loved every minute spent in the pool patio where we relaxed daily. Wifi worked very well as I had to keep in touch with my office and this was a true bonus in Samui Island. Choeng Mon beach is a short stroll from the villa and one of Samui best kept secret beach, restaurants and supermarkets as well as shops are all within walking distance but we highly recommend a trip to Chaweng beach where choice id plentiful. Thank you so much for such a pleasant stay where our memories are still live and where we are looking very much forward to return one day. These are a few examples of what Koh Samui has to offer. On top of this, we stayed in a wonderful villa that easily exceeded our dreams! Comfort and luxury go hand in hand. Private swimming pool, a nice tropical garden, spacious rooms, modern kitchen… Also the owner provide excellent customer service. In-villa service is as high as a good 5* hotel, location. To make a long (,and beautiful) story short… we had the stay of our life! We surely be back soon! Strongly recommended! 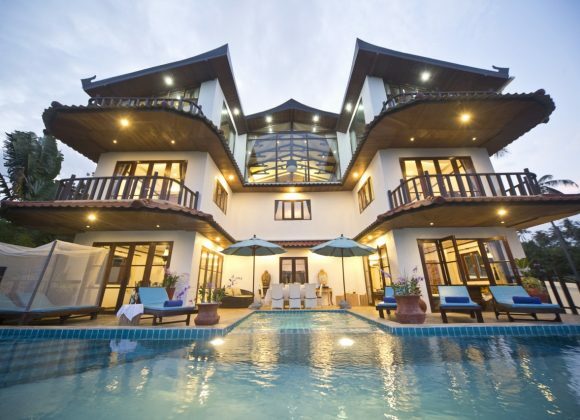 Our family are delighted to have chosen this villa for our stay in Koh Samui Island. The villa, its staff, services, location, amenities were 1st class all the way. Privacy was very important for us and the villa surrounded by lush tropical gardens and a very slight height position were sublime. Views over the pool patio from the Dining room as well as the lounge and lobby area are fantastic and invite you to a true and peaceful stay listening to bird singing and the light breeze passing by. Villa manageress and her team ensured our stay and demands were met and were very discreet which was a true bonus as the villa staff do a remarkable work. Ask to be driven by Cathai in the private golf cart to Choeng Mon white sand beach for the 2 minutes ride, she is adorable. Restaurants are plentiful here but a Private in villa Chef diner with a la carte dining is a must. All in all a true gem set in a superb location with hotel services not to be missed. Thank you to all of you for making our stay a very memorable one. The villa is fantastic, it’s in a private estate only a 5 minute walk down the hill to the town of Choeng Mon where the beach is beautiful. The villa is well decorated, with nice bathrooms, bedrooms and living area. The pool area is well secluded and enjoys the sun throughout the day. The service in the villa is fantastic. The housekeeping girls were very pleasant and the breakfast they made each morning was exceptional. The villa manageress Ong was very good. She was there on our arrival and made sure that we had everything we needed. She arranged car hire for us and the car was there 20 minutes after we enquired about it. The local town is a 5 minute walk with nice restaurants, good massage spas, beautiful beach and a Seven Eleven which was good. There are taxis everywhere and it’s easy to get Chaweng area with good local markets and Bophut Fisherman’s Village with nice restaurants. A bit more expensive than Choeng Mon but very nice. We hired a car for 15gbp per day which was great because we toured the whole island and visited the different waterfalls and other towns. The villa is good for a nice quiet location but with easy access to all needed amenities. It has great staff providing excellent service. Comfortable beds and a nice pool. Nothing negative to say. We had a wonderful time at Baan Chang Villa. It’s a lovely house that is well set up for a family, and it’s close to the beach and amenities. The staff are very helpful, the pool and rooms are beautiful, and there are children’s toys and movies for the little ones. Can’t wait to return! The owner Francisco made a very good impression regarding the booking process, felt honest doing the payment and clarification phase. Lovely villa with beautiful pool and ultra comfy king bed! Only minutes to the best beach in Samui, so was perfect for us as we hired a scooter for the week. Kitchen very well equipped and service staff friendly and helpful. Highly recommend for families, couples …. It’s the most beautiful three bedroom/three and a half bathroom villa, tastefully furnished with a glossy infinity pool overlooking perfectly manicured gardens. Normally the whole idea of staying in a gated community would fill me with dread but I must say that this place felt very different. It was more like a plush and high-end residential suburb close to all amenities. Tropical gardens with exotic birds and colourful butterflies. Fantastic services within your private villa, a true oasis to rest and enjoy a very memorable stay. This was a trip that went beyond our expectations. The service was wonderful; the villa and its tropical gardens were beautiful. The attention we received was personal and prompt.. The island was everything and more that we wished for. Thank you for a marvelous vacation. As the title suggests, the stay was absolutely perfect. Everything from the villa, the location, the service and most of all – the sumptuous breakfast!! We were so spoilt. I would definitely recommend this place to anyone. Cant wait to return, thank you. The house is beautiful in all aspects and the grounds are exquisite. After entering the property across the lotus pond, opening the front door is a revelation. Baan Nai Fun isn’t a holiday villa; it’s a home, and a fabulous one. Decor is sublime and the villa provides its guests with nice rooms and space. The home is catered with all needed services as in a top class hotel. Thank you for such a nice stay. music and even internet access if you wish. The villa is situated in a beautiful lush garden and it is great to lounge in the pool and watch the wild life go about their every day living. The local village is within easy walking distance with many cafes for breakfast and restaurants for evening dinner. There are also local shops, if the desire takes you, to buy the basics to to eat in and dine al fresco by the pool. Choengmon Beach is really great and only a few minutes walk away with very good fresh sea food restaurants and beach massages. The villa is a beautiful place to relax, enjoy and have just a great time and we do highly recommend this villa and estate to everyone. Our experience at your villa was by far the best accommodation we have experienced anywhere in the world. Fone and her staff were extremely friendly, hospitable and provided extraordinary service. Our villa provided us with total privacy with the luxury of our own swimming pool that we could use anytime. Breakfast was included and varied from Continental, American, Thai and was freshly cooked and prepared at the time of our choice each morning by your housekeeper. We highly recommend Villa Baan Chang and are looking forward to return. We had a wonderful stay at villa Baan Chang. The service we encountered in the initial e-mails before our arrival and during our stay was of the highest standard. The villa with the private pool is a real treat as well as the lush gardens and other little touches like having breakfast cooked for you at your requested time. The spa treatments are also excellent and great to do as a couple and we recommend the Eranda Spa very much. All in all we had a brilliant stay and highly recommend Villa Baan Chang if you are looking for somewhere with a little extra luxury and privacy. We absolutely loved staying at Villa Baan Chang. Great location, beach, restaurants and supermarkets within minutes walk. Thank you for providing our family with such a very special stay. Will definitely stay there again without hesitation. Our family of 5 spent 10 days at Villa Baan Chang. We were thrilled with the traditional Thai furniture, huge tropical gardens and pool, creating a magical atmosphere. All three bedrooms were separate, with their own en suits. The staff were very warm friendly and helpful. We would highly recommend, thank you. Villa Baan Chang is absolutely idyllic! We spent 2 fantastic weeks in Thailand with 10 nights of our trip spent @ Villa Baan Chang. We had the most pleasant stay possible at Villa Baan Chang. Villa Baan Chang has met all our high expectations. Fantastic resort in a very good location. No car hire is needed as you are literally minutes walk from all facilities. A party of 7 of us have just returned from a week stay at Villa Baan Cueymaille and could not ask for a more restful, peaceful place to stay. The staff were all magnificent and nothing was too much trouble. We had a birthday party there so they decorated our Villa of which we did not expect at no cost to us…they are fantastic, lovely caring staff. Villa is nicely decorated and located in a beautiful location. We have really enjoyed our stay with you and in Koh Samui. Villa Baan Souha and amenities were very good and comfortable to cater for our party of 6 adults. The staff are absolutely fantastic, nothing is ever too much trouble. Breakfast was prepared to order and was an amazing way to start each day, we had a BBQ in our villa one night which I highly recommend. The grounds are really pretty and the pool is a decent size. The patio area where the pool is, is very well equipped with sun loungers, sofa,table, chairs and umbrella. All in all a great villa in a private and peaceful location within easy distance to all facilities. Stayed at villa Cueymaille in August 2011. There were 7 of us, including 1 child and we absolutely loved everything about this place. The staff,the villa space and its gardens and our private pool, so relaxing – for the first couple of days we found it hard to venture out cause we were enjoying the surroundings so much. The breakfast cooked every day in our villa was a treat and the staff helped us with everything we needed, they are so genuinely friendly it makes all the difference. Would definitely come back and stay. 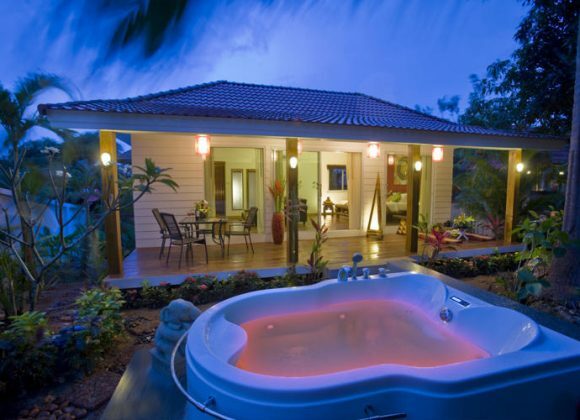 Experience true relaxation in this beautiful villa with superb private services. We had a fantastic time in Koh Samui Island and Villa Baan Chang and its team is part of our holiday success. Let me first thank you very much for the spectacular fireworks display, balloons, Birthday cake and excellent meal to celebrate our twins 10th year. It was a perfect evening and the children had a great time. We all will never forget our holiday celebration at the villa. Our entire week was perfect. The villa was clean and well kept. Our breakfast everyday was delicious. Our transfers were smooth and on time. Your manageress is polite, professional and very helpful. Again, thank you for making our time on Koh Samui a very special memory for my entire family. My husband & I and our two teenage children (18 & 15) stayed at Villa Baan Chang (3 bedroom) in July 2011 for 10 nights, & we all just loved it. The Villa itself was just beautiful, the service was fantastic, the staff were so helpful & friendly, we could not fault this place at all. Hope to go back some day. Excellent!!!!! My wife and I enjoyed our stay at Paradise Island Estate in July, the staff were friendly and courteous and extremely helpful. We have visited Paradise Island Estate in 2 occasions now and as our first visit Fone and her team spoilt us all the way. We stayed at this villa for 8 days over easter and loved it. Living in HKG and being able to come and fly direct to Samui is a must for us and a very nice break home from home. All you need is there to enjoy a nice beach holiday in paradise. We would give this accommodation 5 out of 5. Our honeymoon @ Samui was very nice thanks to all the special touches and services provided by Fone and her team @ Paradise Island Estate. Villa Baan Chang is romantic, chic, adorable and all we could have wished for. Isolated and surrounded by palm trees and very nice gardens but only minutes walk from bars, restaurants and of course beautiful Choeng Mon Beach and its activities. You are not overlooked anywhere in the villa as privacy was a must for us and we greatly appreciated all the services and professionalism from Francisco who made our dream come true. We will return with our 1st child, Katia. My wife and family spent a fortnight @ Villa Baan Chang and had one of our most memorable holiday ever. This villa offered everything we dreamt of. Try the Sala restaurants for lunch or dinner. Just returned from a very nice vacation at Samui beautiful Island. We made the right choice choosing Villa Baan Souha as its beauty, services and location were fabulous. The villa is walking distance to everything you could possibly wish for and need, furnished with style and comfort in mind. Spas are widely available and will recommend The Eranda Spa in Chaweng which is scenic and awesome. We will return to this beautiful estate and can only highly recommend it. Lovely house situated in a wonderful position with breathtaking views from its balconies. We loved the fact of being able to walk to this beautiful beach with all facilities available. The holiday we had at paradise island estate is one to remember and we wanted to give our thanks to you all for a very very nice and special holiday we all loved. Dear Francisco, I just wanted to let you know how wonderful our holiday was at your property and Samui. The villa and its design are just beautiful, conveniently located and with amazing staff. 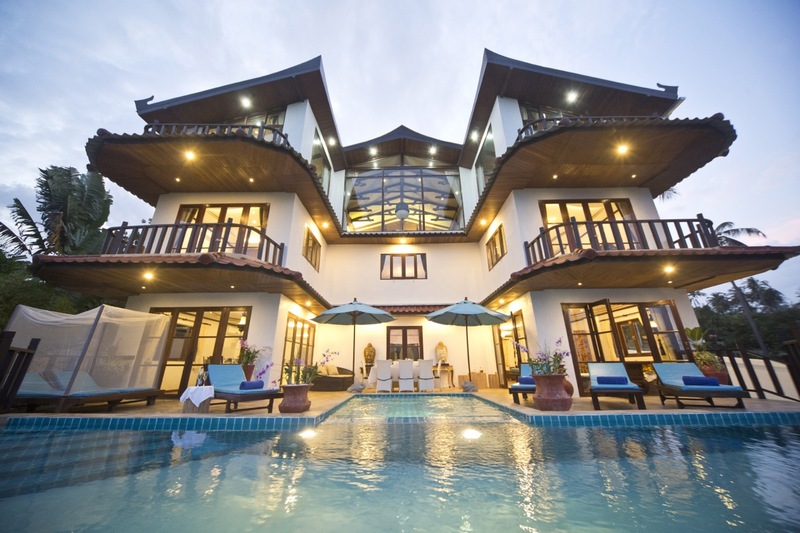 We love the Thai culture and we loved how well your villas go with the scenery. All was organized to perfection for us and being Swiss I can only congratulate you for doing such a good job. Hi Francisco, We all had a very relaxing time and fabulous holiday @ Villa Baan Chang. Fran, We truly enjoy our stay at your resort and would like to thank you for all the extra little touches and presents for our children as well as your attentions during our stay. Dear Francisco, Very special vacation at this private villa under the warm sunshine for a different Christmas. Hello Francisco, Thank you very much for such a nice stay @ Villa Baan Cueymaille and at your estate. We enjoyed our time at Choeng Mon beach enormously and could have not ask for a better location. Dear Francisco, Our stay at the Villa Baan Souha was awesome. We were very pleased by the reception and the availability of your staff. The friendliness and helpfulness of Fone and her team. I just want to let you know that we had a wonderful, relaxing time in Villa baan Souha. It lived up to the expectations and more. We have not long returned from spending 10 nights at this wonderful villa.The accommodation and setting are both first class and set within walking distance of a superb beach and restaurants. Villa Baan Chang has full privacy being surrounded by 3 sides by lush tropical gardens and not having neighbors on 2 sides, a true peaceful heaven with very attentive staff led by Fone who was remarkable. The whole concept made of our stay one of our best ever holidays and a place we really look forward to visit again. THANK YOU very much for everything being organized so well. The transfers, the dinners, the massages etc. It was all very timely and somehow discrete. We enjoyed Samui very much and are thinking of coming back next year to discover new places. You were right about the beach. We went to see the other ones and gladly realized that Choeng Mon is one of the best with regard to low tides and sand. BUT the very best part of our stay was our villa manager Fone!!! The girl is amazing!!! If you have any ways to promote her, please do so. We did )) She is brilliant, remembers everything, is attentive and efficient. AND SHE COOKS!!!!!! she is an amazing cook. It was not only extremely delicious and diverse, but also very beautifully served. We tried to eat outside couple of times, and it was all kind of pale comparing to her. We are glad that we had her. The cleaning girls were very good and it was indeed clean inside and outside, gardener and pool cleaner all perfect. Thank you for such a memorable vacation. Dear Francisco, Thank you for your wonderful villa! All was perfect and your staff was very friendly and helpful! I will recommend your villa to my friends. We stayed at Villa Baan Chang in June for 10 nights and had a fantastic time. This was our second visit to Samui and are all very pleased to have found this villa. Location is great are you are just across a superb beach safe for all the family and all amenities available. The estate is very well looked after and managed with all services you will find in a high class hotel but here you have the staff to yourselves and the space and privacy of your own pool villa. Gardens are lush and divide the 3 villas which are all private. The villa is very comfortable and decor is sublime. Fone and her team do make you feel very welcome from the time you arrived and they do a great job. All in all, we all look forward to return to your resort soon and highly recommend this beautiful place. Francisco Thank you. We had a fantastic time. Our 2nd time in Thailand and it just got better. The people, the food, the atmosphere….. Amazing. Already talking about our trip back !!! Many thanks for all your help and your swift response to our queries and we all look forward to return soon. We were greeted by Fone and her team upon arrival and they made us feel home straight away. Reception,villa decor ,location and services are of highest quality. We had a very nice stay and felt relax and home from the start. We highly recommend a stay in one of your villas and thank you for organizing such a good vacation for us all. We highly recommend the Private Chef service for an In-villa dinner, just sublime. See you again!!!! Hi Francisco, We had a wonderful time in Samui and our stay was great, Michelle and the girls were fantastic. We stayed for a long weekend. The owners were really helpful in organising our visit itinerary. We had such a wonderful time. The kids enjoy playing in the pool which you access from several points of the villa. It is really private. The house has an excellent finishing using superb quality furnitures/decor. There’s no doubt that we will be back soon. We had a very pleasant stay at your villa and the staff in place were very friendly and made us feel really special. We will remember your private little estate as our private slice of true paradise. The location of the villa is very peaceful but a short walk from every amenities required. Views are magnificent, you do not get a full seaview but looking across the lush landscaped gardens was out of this world. This is a 3 villas estate and they were other clients staying that we made friends with and we agree on how private and excellent the villas and services we received were. Overall a great experience and we would recommend it to family and friends. We stay for 3 weeks in Villa Baan Souha and take home very very good memories of our stay with you. You provided us with hotel services in a very private way and the villa and its tropical gardens are superb. The staff is at your disposal and you will not notice them much but everything is kept very well. We are from Cambodge but live in France and stopped over for a week on our way home. We had a superb and relaxed stay in your estate. You were looked after by a very good team and the villa and surroundings complete the image of paradise on earth. We had our Easter break in Koh Samui as Villa Cueymaille was recommended to us by friends. We had a superb beach holiday and your villa and estate is remarkably done and finished to high standards. Staff, location and villa excellent. We loved our daily breakfast being served in the warm pool patio. Thank you. We had the pleasure to stay at this villa for our 12th wedding anniversary and our children. The villa is immaculate, the staff were very friendly and efficient, the views are spectacular. Michelle our villa manageress organised and met all our requirements and we would like to thank all your team who made our stay a dream comes true. My friends and I made the right choice when we booked our 10 night stay at Villa Baan Chang in December 2008. The Villa itself is beautiful. Superbly decorated with a feeling of real luxury. The towels and linen are of high quality, the beds very comfortable and the villa is spotlessly clean. The outside space is totally private and sitting around the pool, day or night surrounded by tropical gardens, was truly wonderful. Apart of the perfect choice of Villa, the service that we received from Michelle and her team was fantastic. From being met at the airport to our departure, nothing was too much trouble for Michelle. Her team provide the most relaxing breakfast with everything you could wish for and more – all beautifully presented. If you are looking for a great location, a bit of luxury, comfort, privacy and excellent service, then look no further – this one is guaranteed not to disappoint! We are 2 couples from france and have spend 10 days at Villa Baan Chang and had to write few words to say we had a fabulous time and all was as described and shown and even better. The villa is very nicely furnished , designed and well equipped, fuses thai style with all the modern facilities. Landscaped garden out of this world, i wish i could have taken some plants back home. There must be something special at villa Baan Chang as we now have made 2 visits in a year. My friends and i had a fantastic time in Koh Samui and the villa was everything and more than we had expected. We love the location and the villa was really spacious and comfortable, landscaped tropical gardens are magnificent. I can say with confidence on behalf of my friends that it was definitely up to standard and we didn’t have any problems with it. We were really impressed by the kitchen and the size of the bathrooms. With regards to the service provided by the staff (May Michelle), that was also brilliant. We were glad to have them around, especially on the first day as we had no idea where we were going. I am particularly grateful to them and very please with our experience at Villa Baan Chang. We just had to write to say what a wonderful time we had staying at Villa Baan Chang. The villa and it´s subtropical gardens were out of this world and Michelle, Monika, Paat and all their team were there for us whenever we needed anything. They were remarkable and very helpful. We walked or cycled down to beautiful Choeng Mon Beach everyday. The children were so happy there, they didn’t want to return. Choengmon had everything we required for our family beach holiday, that we hardly felt the need to spend anytime elsewhere. We took the opportunity to make the 10 minute taxi journey into nearby busy Chaweng twice, but could not wait to get back to our beautiful peaceful villa. Just as you stated in your advertising,the whole setup is orientated towards providing a private villa setting,but with many of the facilities you would expect in a top class hotel. The icing on the cake, so to speak was our final evening, when Monika arranged for a Thai chef to come into the villa to cook dinner for us. It was a meal fit for a King! All of which was served outside by the pool, with candle light and under a starry sky. The perfect finish to a perfect holiday. Thank you for everything and see you again. James, Michelle, Ben and Rosie.